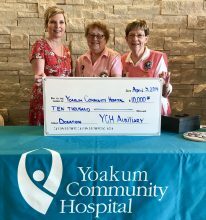 On Friday, April 5th, the Yoakum Community Hospital Auxiliary made a generous donation of $10,000 to the hospitals Greatest Needs project. The donation will go towards the purchase of new colonoscopy and endoscopy equipment. Dr. Richard Rogers, who specializes in Gastroenterology and has been serving the Yoakum area since 1998, will be able to use this equipment to enhance the quality of colonoscopy and endoscopy procedures performed at YCH. The Olympus EVIS EXERA III video endoscopy/colonoscopy equipment is setting new standards with advances in visualization, operator control, and workflow management. Enhanced imaging technologies include HDTV for superior clarity; next-generation Narrow Band Imaging for enhanced observation of mucosal tissue; and dual-focus capabilities that will allow switching the depth of field from normal focus to near focus for more detailed observation of suspected lesions. “The advancements in the new equipment will improve overall results and comfort for our patients. We are thankful to our Auxiliary for continuously working to help provide our hospital with new, state of the art equipment,” stated Karen Barber (CEO). Pictured left to right: Karen Barber (YCH CEO), Suzanne Sestak (Auxiliary Treasurer), and Shirley Hanzelka (Auxiliary President).